Tottenham, Liverpool, Arsenal and Chelsea...it's going to be some end to the season. Napoli manager Carlo Ancelotti, speaking to BT Sport: "We are not happy of course but in the two games where we didn't do too well was the first 20 minutes in the first game. We tried today. The first goal made it almost impossible. We needed to score four goals and lost confidence. We needed to score quickly. We had two opportunities." Arsenal boss Unai Emery, speaking to BT Sport: "I am proud of the players. We started very well. The first half was good because after we scored we continued not to give them opportunities. We defended well second half. In the two matches we can be happy to win against Napoli." On semi-final opponents Valencia: "They are a very good team with goods players. It will be a difficult match for us." On Aaron Ramsey: "It is a muscular injury. Normally it will be some weeks out for him. But we have other players and we can find a performance and rotate players." Asked if Ramsey has played his last game for Arsenal, he responded: "I don't know". Speaking to BT Sport, Chelsea defender Cesar Azpilicueta said: "It is a mistake we are making very often and we are conceding early goals in the second half of games. We were 4-1 up but they put us in trouble and we were risking it. We were suffering until the end. "It is not the way we want to win the trophy but we are in the semi final and hopefully we can get through." Chelsea boss Maurizio Sarri, speaking to BT Sport: "We started very badly in the second half but I'm really really happy because we played well in the first 45 minutes and we are in a European semi-final which is very important to us. "We knew very well the match was going to be difficult. They ran a lot and with quality - lot of metres at high speed." More from Arsenal defender Laurent Koscielny, speaking to BT Sport: "We know Napoli played in the Champions League this season. They are a good team. We did the job at home. Today we knew if we scored they needed four. We fight to defend and suffer together." Speaking to BT Sport, Chelsea striker Olivier Giroud said: "We started well with good intentions. We have been efficient up front and solid at the back but we dropped our intensity after the break. This team never gives up and the last 10 minutes was box to box. It was a good fight and now we are in the semi-finals." Arsenal defender Laurent Koscielny, speaking to BT Sport: "We came here with ambition and wanted to win and score some goals. We did it with Laca. We keep a clean sheet, which is important for the confidence. Each game we have in front of us is a final. Tomorrow we switch back to the Premier League." Next time a manager moans about two games in 72 hours point them in Arsenal's direction. Jon Spurling: Well done Arsenal - two tricky away games within 72 hours and two wins, with no goals conceded. Onwards and upwards to Palace at home. Some more details about the Europa League semi-finals. Chelsea will travel to Germany for the first leg against Eintracht Frankfurt while Arsenal will host Valencia before heading to Spain for the return leg. First legs take place on 2 May with the return a week later on 9 May. Anyone for a full English? Anyone else fancy a Spurs-Liverpool Champions League final and a Chelsea-Arsenal Europa League final? Arsenal will face Valencia in the last four. They beat fellow Spanish side Villarreal 2-0 tonight to complete a comprehensive 5-1 aggregate win. Chelsea are up against Eintracht Frankfurt, who staged a superb comeback from 4-2 down in the first leg to win 2-0 in Germany and seal an away goals victory. Still playing in Italy where Arsenal are moments away from joining Chelsea in the last four. 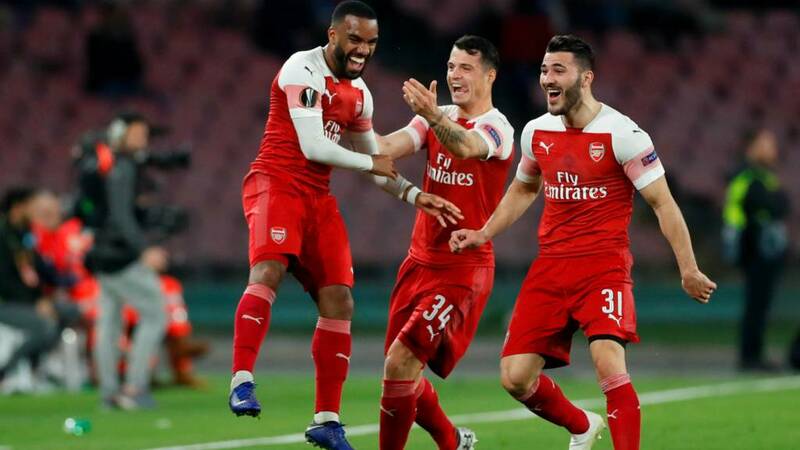 A very good performance by Unai Emery's men who lead 3-0 on aggregate. A game of two halves - but Chelsea are in the semi-finals. Chelsea are almost there - but boy oh boy they've made it hard for themselves. Up steps former Chelsea man Stoch - it cannons into the blue wall and away. Slavia Prague free-kick inside the 'D' after David Luiz's needless handball. Breakdown in communication between Kepa Arrizabalaga and David Luiz almost leads to a Slavia chance. Callum Hudson-Odoi is on for the final few minutes for Pedro.